8th Grade, Don’t forget: Today is the deadline to make changes to your high school elective course requests. If you have questions, please stop by the Counseling Office to see Mrs. Stoudemire. Attention Reading Olympics students. Our next lunch meetings will be on Wednesday, April 5th. Thank You. Today in first period classes all students will receive a paper that tells their PSSA Proctor and Location. If your teacher has not yet passed out the papers, now would be a great time! Teachers, if you forgot to get them in their mailbox, please send a student now. Everyone in the building will report to their PSSA locations today during 9th period and then on each PSSA day. Please remember that we start PSSAs next week and it is so important for everyone to show up on time each day. If you have any questions about PSSAs, please ask your first period teacher or your PSSA proctor during 9th period. We are so excited to see how you perform on these tests and we know that you will do your best! The Dental Hygienist will be doing dental exams in the nurses office today for 205 students in 7th grade whose last name begins with A through R who have not already provided a report from their private dentist. Students with last name S through Z will have their teeth checked next Friday, April 7th if they have not provided a report from their private dentist. Passes should be given to these students during homeroom. The exam is very brief so be sure to arrive promptly in the nurse’s office for your scheduled dental exam. However, if you are scheduled for a classroom test during your dental exam, please see Mrs. Shannon to reschedule the time of your dental exam. The KMS administration have requested the assistance of parents to monitor the hallways during PSSA testing. A handful of volunteers are needed each day to help keep the hallways quiet and orderly. If you think your parent would be able to help out send them to the link on the PTO email. Please stay tuned for Flocabulary Friday. 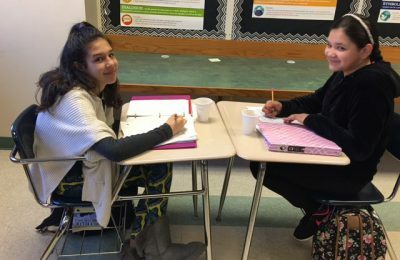 Sixth grade language arts teacher, Mrs. Jackie Knight, is hosting a West Chester University practicum student, Ms. Catherine Maleski. 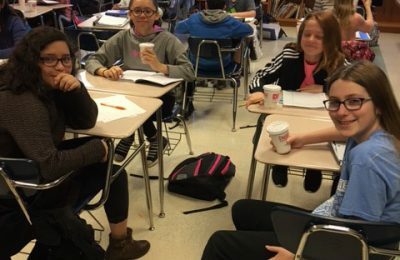 As part of her practicum work, Ms. Maleski conducted a lesson based on poetry that she wrote. During the lesson the students discussed the poet’s purpose, tone and emotions. In connection to Ms. Maleski’s writing about childhood memories in her poem entitled “Where I’m From,” she referenced drinking hot carob on the farm where she grew-up. 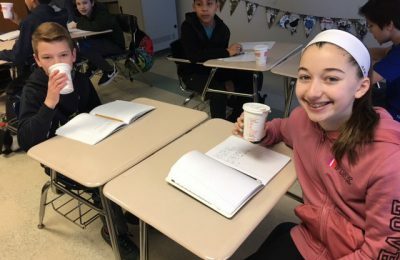 To tap into different learning styles, she brought in hot chocolate for the student writers to enjoy while they were writing. 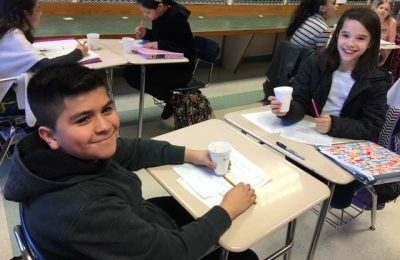 The students loved sipping hot chocolate while writing their own “Where I’m From” poems. 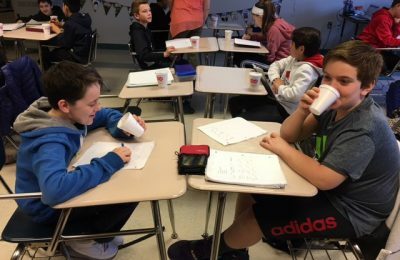 The students hosted a Poetry Café in their classroom to share their writing. The poems will be displayed in Mrs. Knight’s room during Kennett Middle School’s Spring Open House. 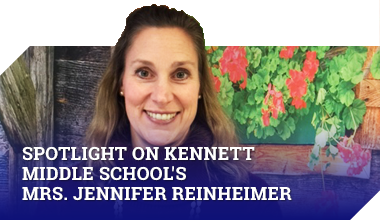 The students are sure Ms. Maleski will make a wonderful teacher in the future, and everyone at Kennett Middle School wishes her all the best with her studies at West Chester University! 8th Grade, Don’t forget: This Friday is the deadline to make changes to your high school elective course requests. If you have questions, please stop by the Counseling Office to see Mrs. Stoudemire. Attention Reading Olympics students. There will be no meetings at lunches this Thursday, March 30th. Our next lunch meetings will be on Wednesday, April 5th. Thank You. 8th Grade students, Technical High School Permission Slip Due: April 3rd – you don’t need money for this trip, please just be sure to turn in the permission slip asasp. Here is the last request for the 8th grade. You are especially busy! The Permission slip along with $45 for the Eighth Grade Class Trip to Greater Valley Forge Picnic and Sport Complex is due by April 18th. Passes should be given to these students during homeroom. The exam is very brief so be sure to arrive promptly in the nurse’s office for your scheduled dental exam. The state of PA requires Dental Exams for all 7th grade students. On Friday, March 31, our Dental Hygienist, Tanya Phillips, will be doing dental exams for all 7th graders who have not already provided a report from their private dentist. If you have a dental report from your private dentist at home or in your bookbag, please bring the report to Mrs. Shannon by Thursday. Passes will be given to 7th grade students on FRIDAY morning during homeroom for those who need to have their teeth checked briefly in the nurse’s office. There will be an FCA huddle this Thurs at 6:50 in mr Bowlings room. Breakfast will be provided. Bring a friend!! This announcement is for the band students who played for the 5th Grade visit. Please report to the band room at the beginning of 3rd period today.. Any questions please see Mr. Whisler. Attention 8th Grade Students: Mrs. Stoudemire and Ms. Topp are starting a STRESSBUSTERS small group for students who are experiencing stress and anxiety. If you feel that you could benefit from growing your StressBuster toolbox, please stop by the counseling office for a group permission slip today! We would like to have all permission slips back by this Monday, March 27th! Students and Staff please be aware that all 5th graders in the district will be visiting KMS this Wednesday, Thursday, and Friday from 9:15-10:45 a.m. A different school will visit each day. Keep your eyes out for students as they’ll be taking a brief tour of the building from 10:00-10:30 am. Students please also be aware that our PE classes are relocated because the big gym is hosting our visitors today, periods 3, 4, and 5. 2nd period PE will go on as usual. There will be a sign stating relocation classes posted at the end of the 6th and 7th grade wing and on the locker room doors. At the end of the announcements, 7th graders report to your assigned starting room for the carnival. If you do not know your room, please talk to your homeroom teacher. Have fun! This announcement is for the band students who played for the 5th Grade visit. Please report to the band room at the beginning of 3rd period today and tomorrow. Any questions please see Mr. Whisler. Students please also be aware that our PE classes are relocated because the big gym is hosting our visitors today, tomorrow, and Friday periods 3, 4, and 5. 2nd period PE will go on as usual. There will be a sign stating relocation classes posted at the end of the 6th and 7th grade wing and on the locker room doors. Mr Howanski’s classes will still be in the small gym. Stay tuned for This Day in History. There will be a rehearsal today during 8th period for 7th and 8th grade Orchestra students for Music on Parade. Girls lacrosse tryouts will begin today. Be prepared for indoor and outdoor practice every day. Be sure you are cleared with Nurse Shannon today.. See Ms. Frattura or Mrs. Fairchild with any questions. Students and Staff please be aware that all 5th graders in the district will be visiting KMS this Wednesday, Thursday, and Friday from 9:15-10:45 a.m. A different school will visit each day. Keep your eyes out for students as theyÂ’ll be taking a brief tour of the building from 10:00-10:30 am. Students please also be aware that our PE classes are relocated because the big gym is hosting our visitors today, tomorrow, and Friday periods 3, 4, and 5. 2nd period PE will go on as usual. There will be a sign stating relocation classes posted at the end of the 6th and 7th grade wing and on the locker room doors. Mr HowanskiÂ’s classes will still be in the small gym. Today enjoy your half day and the last day of conferences today. Girls lacrosse tryouts will begin Wednesday, March 22nd. Be prepared for indoor and outdoor practice every day. Be sure you are cleared with Nurse Shannon by Wednesday. See Ms. Frattura or Mrs. Fairchild with any questions. Stay tuned for Merriam Webster’s Buzzword of the day. As many of you may NOT know, After-The-Bell is run solely on generous donations & grants from companies, foundations, and people just like you! Students will be bringing home a donation request letter from After-The-Bell this week. Even if you are not currently participating in After the Bell you can support the program. You may send in your donation to the middle school in an envelope marked ‘ATB Direct Giving Campaign’ or donate online. There is a link in the email from the PTO. Just a reminder, tomorrow we have an early dismissal to complete the last day of conferences. Please double-check your conference times. For all the 7th graders out there, Mr. Shepherd and Mrs. Reinheimer are looking for students to be a part of our Mindfulness group. Mindfulness is a mental state achieved by focusing one’s awareness on the present moment, while calmly acknowledging and accepting one’s feelings, thoughts, and bodily sensations. If you have interest, ask the counselors to sign a list at lunch. Students will be required to obtain parental permission to participate. As many of you may NOT know, After-The-Bell is run solely on generous donations & grants from companies, foundations, and people just like you! Students will be bringing home a donation request letter from After-The-Bell this week. Even if you are not currently participating in After the Bell you can support the program. You may send in your donation to the middle school in an envelope marked ‘ATB Direct Giving Campaign’ or donate on line. There is a link in the email from the PTO. Today and tomorrow we have early dismissal. Notice the schedule tomorrow, we come to school and go directly to 4th period. Again, tomorrow we start the day in 4th period. This weekend KHS will be performing their musical, The Drowsey Chaperone. Get your tickets and enjoy the show. We wanted to let you know that tomorrow we will not have morning announcements because we start the day in 4th period. We will do the pledge from the main office just after the 7:40 bell and the rest is history! Please stay tuned for This Day in History Thursday.